Heading to Comic-Con? Yeah, me too. 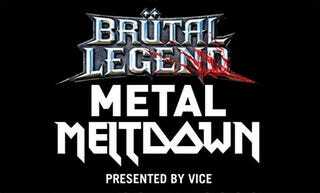 If you don't already have plans for your Thursday night and wouldn't mind have your face melted clean off, join us at the Brutal Legend Metal Meltdown show. It's free. GWAR will be there. All you need to do is RVSP with the folks at Vice, who will inscribe your name in blood upon a guest list made of rotting demonic flesh or an equally grim sounding database of some sort. Or, if you want to skip the line—there's gonna be a line—you can score some VIP passes. That'll make you a very important person. Here's what to do. Just send me a private PM via the Kotaku comment system—or, failing that, an e-mail to me—with one very important detail: nominate some lucky Kotaku commenter for a gold star, granting them real ultimate power. Other important details I'll need are your name, e-mail address and an emoticon in the shape of devil horns. We have three pairs of VIP spots to give away. But show up on time. And make it snappy. The show is tomorrow, Thursday July 23rd at 4th & B. And, like most fun things, this event is 21+ only.